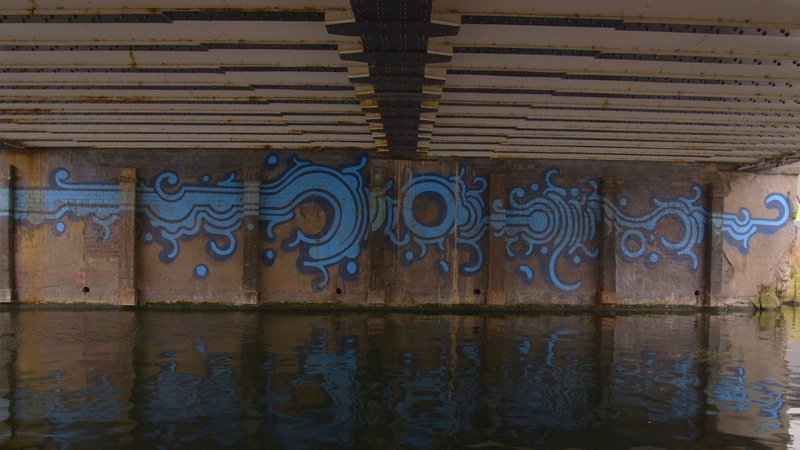 Michael Pattison | idFilm: Edging the City: "Lea River Bridges"
Edging the City: "Lea River Bridges"
Speaking to Jonathan Perel about my new film Lea River Bridges. It began in London, on the Lea: an eighteen-mile trudge along one river towards another—the Thames. Iain Sinclair walks this route, in reverse, at the beginning of London Orbital (2003)—a prologue to his manic tramp around the city’s perimeter. A return, then, or entry: here we were, walking—and walking—back through the city, through the London of William Blake, of Daniel Defoe, of Arthur Machen. The London, in more recent times, of Will Self and Patrick Keiller. J.G. Ballard, when he was alive, was way out west—in Shepperton—and this was east: another interstitial realm. Lea River Bridges, made as part of a practice-based PhD at Newcastle University’s Film @ Culture Lab—and funded by the UK’s Arts and Humanities Research Council—takes the many overhead viaducts spanning the River Lea and Lee Navigation as its structuring principle. By limiting our variables (shots are more or less identical in composition and duration: 45 seconds per shot, with 2 seconds of black in between each), we are asked to renegotiate our mode of engagement: trained toward the peripheries of frame, and increasingly aware of a shifting soundscape, we encounter—and come to anticipate—the dramatic fluctuations that unfold across these everyday urban ecologies. This is a study of London from one of its key edgelands, capturing a landscape defined by industry, marshland, gentrification; by motorways, railways, canal boats; by joggers, dogwalkers, cyclists; and by, somewhere in the near distance, generator hums, police sirens, church bells. Ahead of its world premiere at London’s East End Film Festival, I sent the film to Jonathan Perel, whose exceptional film Toponomy had been on my mind, back in September 2015, when I first announced a desire to make the film. Jony, after watching the work, sent some queries back. Jonathan Perel: I liked the blacks in between each image. It's always difficult in these highly structured films and framings how to cut from one shot to the other. What was the effect when cutting directly, without black? Michael Pattison: I needed the black to give some indication of movement between each bridge. There's a tension between the stasis of each image and the sense of a journey between them. The only practical way to shoot this film is to walk the river. You can't do it by getting in and out of a car, for instance. 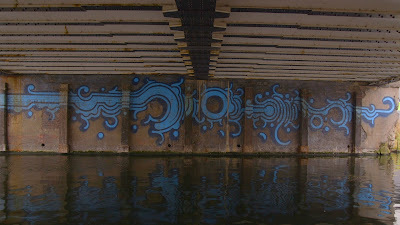 The Lea is about 48 miles in length, but I only walked the 18 or so from where it cuts into and through London itself. To begin with, I wanted to keep the level of the river precisely the same from one shot to another, to limit the variables to a bare minimum so that the fluctuations in landscape could be emphasized. But it wasn't so easy to do this once I began the walk, so I needed the black screen to give some space; it would be too jarring to cut directly, especially early on, as the horizon changes. So we have two seconds between each bridge. I think it also gives a sense of completion to the preceding scene and gives the viewer time to prepare for the next one. Like having to cleanse your palette between food dishes. What I don't like is the black without any sound. Sound from the next shot should be there during the black gap. I did play with this, and considered different options: some kind of musical track, or to work with diminuendos and crescendos between the images, to retain some idea of what Iain Sinclair would call the ‘sonic footprints’ of the landscape. But in the end I opted for the purity of absence, in order to emphasize some of the more dramatic changes in sound, such as when we cut from a very quiet scene to something under a motorway. The blacks give a punchy rhythm: a kind of ‘out’, then ‘in’. I became fixated by the direction of the water, and was always thinking about that at the beginning of each shot, maybe trying to follow the direction of your route in my head. Did you ever think about this while editing? A lot of people have commented on this, wondering if the river is tidal. In truth, the only way to make this film is to follow the footpath, which keeps crossing the river. I had to cross the river quite early on: there’s a change in the flow within about three shots! Actually, another reason to have the black screens was so that these changes in river flow wouldn’t be so distracting. Cinematography. Two things I love. First, the changes of light within the shot. In most of them I was expecting a longer take. I could have stayed there watching the light changing much longer. Second, the range of highlights and shadows living together in the same frame: very dark areas, but still with information, and very bright skies, which are also not burnt out. The changes in light are remarkable, not only from one image to the next but also, as you say, within a single take. As my working method is to walk—I'm trying to ask what it means to make a psychogeographic film here, trying to investigate the extent to which we can capture the subjective experience of a single dérive across a stretch of urban or quasi-urban landscape—it was important to shoot the film in a single day, across 18 miles, carrying the Canon C100 and a heavy Libec tripod. But I didn't: I had to do it over two very cold days in January, two weeks apart, owing to lighting conditions. The first twenty or so shots were done on one day, the rest of the film on another. Alongside very dramatic fluctuations of a changing London cityspace, I knew I wanted to capture very banal fluctuations such as weather. I was very lucky: in the first shot of the film it's snowing, and by the fourth shot it's bright and sunny. These were filmed about 30 minutes apart from one another. The minimalist framing works just perfect. Did you only shoot this, or did you try something else? 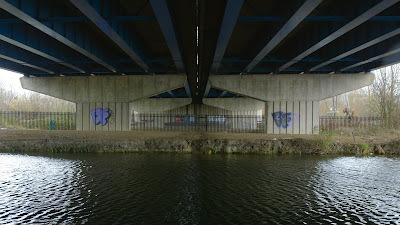 I actually noted a desire to make this film in September 2015, and the genesis for the project formed a couple of months before that, when I first walked this route and noticed the number of bridges you walk under when doing so. With bridges I suppose the common presumption is that you approach them or cross them. You don't associate them with this vantage point, or with hanging out under them in order to dwell on this vantage point. So I knew very early on that this was going to be my framing choice. It wasn't until later, when I arrived at the river alone with my filming equipment, that I realized there would be difficulties, such as how to frame bridges that cross the river diagonally as opposed to at a perpendicular angle. I had to break my own rules. The opening and closing shots, with a different framing, are needed, although I don't really 'understand' the first one. It just worked for me as an index of somewhere in Great Britain. What is that church? It's Waltham Abbey, the burial place of Harold II, England's last Anglo-Saxon King. This is the start of the route I walked for the film. 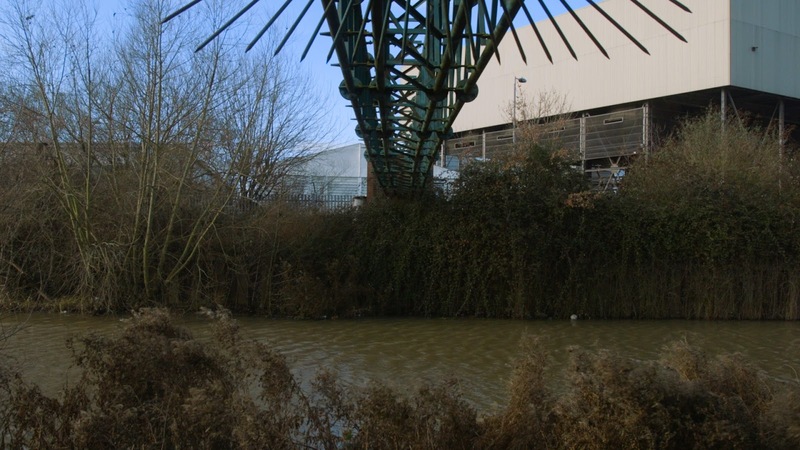 At the beginning of London Orbital, Iain Sinclair walks up the Lea to escape London and the neoliberal currents then encroaching upon the city, as encapsulated by the Millennium Dome. Sinclair finds refuge by walking the entire perimeter of the city, the M25 ring road. I thought of reversing the route he undertakes in his prologue, as a way of returning to London, heading towards the Thames. I'm an outsider marching in. Some information was missing for me. Ideally a map, maybe of camera positions, or a text, a document, a voice over; at least a shooting date or shooting period. When somebody mentions this for my films I don't like it at all. But anyway, a minimum of information I believe is needed. I toyed with this. But it would be secondary material. I can't think of a way to position something like a map within the film itself. This is my first film without any voiceover or dialogue. My two most recent films before this, Memories & Desires and Play History, were both essay films that employed narration in a very consciously subjective way. But for this film, I didn't want to imply any authority about this particular landscape, because I’m not an authority. It's more about what we might glean, as amateur drifters, through this structural device, which is taken from the landscape itself: the bridges. As soon as you add voiceover, or text, it becomes a film about the mechanisms of rumination, it becomes a film about that specific mode of reflection. I'd like to allow some space between the physical journey I undertook to make the film and the viewer's own imaginative journey when watching it. I didn’t want the images to be illustrative of some other argument: they have to become the thesis itself. How much did you shoot for each shot? It's really impressive how each of them has a very unique internal choreography of things: moving vehicles, ships, pigeons, ducks. This was fantastic. I don't think you were so lucky. You probably spent some time in each bridge. I spent longer at some bridges than others. I think the shortest take I shot was just less than a minute, so I knew none of the shots were going to be more than that, since they all had to be the same. I arrived at 45 seconds for each shot by identifying the most action-packed shot and figuring out how much time I needed for all of the actions within that shot to come to some kind of conclusion: it’s the shot where we first see the canal boat go through the frame, with the train going overhead and some kind of barbecue happening across river to the right of the frame. I needed around 45 seconds for all of that to conclude, and then I applied the same duration to every other shot. It’s fascinating how easily each composition, each set-up, loaned itself to the choreographies you mention. To begin with I very deliberately cut just when the shot becomes interesting in a traditional sense, when ducks or humans enter the frame for instance. Later, as we enter a busier London, where the Olympics site was built and where a seemingly permanent state of construction and gentrification is unfolding, I began to let the human element take over. For me the film was too short. I truly believe each film has its duration, that has nothing to do with festivals or distribution. But anyway, medium-length is uncomfortable. This film could perfectly fit in 60 minutes and be a proper feature length. Plenty will find it too long! I was afraid of outstaying my welcome. I wanted to test my durational limits without fetishizing them. It’s a tricky balance. After I’d shot the film but before I’d begun to edit it, when people asked how long it would be, my honest answer was that it depended on how many bridges there were. I knew that each shot was going to be the same length, and I knew that some shots were going to be more interesting than others, which I was perfectly fine with because some bridges and their surrounding landscapes are more interesting than others. But I like how we come to anticipate these dull stretches, and I hope that by imposing such a structural device we re-train our terms of engagement, or our mode of viewing, and begin to look to the sides of the image in order to find new meanings and values in this environment. Graffiti is a key protagonist. Yes. In the first essay in Lights Out for the Territory (1997), Sinclair makes a point of recording various graffiti tags. The city takes much of its meaning from these amateur scribes. My favorite, which isn't in the film, helped me mark a transgression of boundaries during the shoot: “DEFINATLY NOT IN HACKNEY NOW." I can't help but find an Emigholz influence, and a reference to Maillart’s Bridges (2001). That film is all about being under the bridge. Yeah. When I interviewed you in Vienna about Toponymy and mentioned Emigholz, you said something that I very much had in mind when forming the idea for Lea River Bridges. I quote the transcription: “From Emigholz I'm taking this very simple idea that the bridges from only one architect can be the subject of a film.” I think Emigholz would probably list the architect of each bridge and the dates of its construction, though. The images here are nice, but I still don't like that Canon look. For me it is too video-like. That's a documentary run-and-gun camera. For this kind of films I like other types of cameras, with more cinematic texture and resolution. Next time please borrow mine! This was my first time using a camera since May 2012, when I shot Play History. I shot that film on a Panasonic TM700. I know next to nothing about cameras. I think the key advantage of using a camera like the C100 is the data it captures that you’re not even aware of, which allows for some wonderful color grading. I hadn’t even thought about grading it; I was very happy with how grim it all looked. But then after doing even a basic grade, I compared it to the footage I’d shot and couldn’t believe the difference. It was like I’d shot the whole thing in monochrome! I don't fully like the title. It's okay, but it's also a 'working title'. I believe the title in a film like this is almost the only possible place where some meaning or poetic intention can be created. Similar to my rationale behind not having any voiceover or contextual information, I didn't want to impose any kind of authorial intentions onto the work. My hope is that the poetry is located in the viewing process itself, which depends on the totality of the work—i.e., you need to see the whole film because the bridges and compositions only really mean anything in relation to one another. The title was always going to be Lea River Bridges to me. I like its descriptive quality, its indexical purity. Some of the viaducts in the film aren't even bridges in the ordinary sense, but they're vital parts of the city's infrastructural makeup, carrying water, electricity and so on. 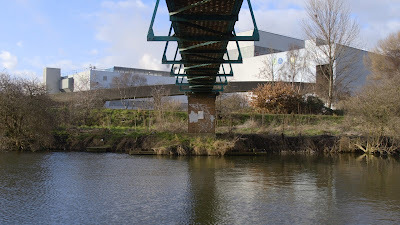 Somebody asked me why it isn’t “River Lea Bridges.” In the synopses and supporting material I revert to the more common formulations—River Lea, and Lee Navigation—but I like the way my title sounds phonetically: saying the title aloud, you could be saying someone’s name. “Leigh River Bridges.” Jeff Bridges’ long-lost niece.